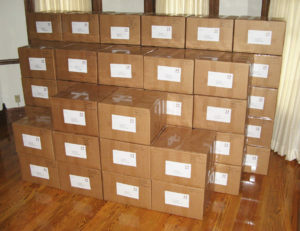 We shipped 60 boxes, an estimated 1320 pounds, and a total of 3775 items! The boxes included so much warmth! We hope that in the future we will be able to show you pictures of some of these items being worn by the beautiful Afghan children! Wool-Aid is very pleased to announce that we are once again partnering with the Lamia Afghan Foundation to send warm woolen clothing and blankets to children in Afghanistan! The Lamia Afghan Foundation is operated by retired Lt. Gen. John Bradley and his wife, Jan Bradley, who work with the Denton/USAID program to transport the Lamia Afghan Foundation’s relief aid on military aircraft. (A May 2015 article about the Bradleys and their work in Afghanistan can be found here.) Wool-Aid shipments will most likely be combined with relief shipments from other organizations that are providing food, clothing, and other aid. We anticipate that Wool-Aid items will be distributed to children in orphanages and other institutions, where wool clothing and blankets are likely to be well cared for and passed down from one child to another, each item thus warming multiple children. All of our Wool-Aid focus items—hats, socks, sweaters, vests, mittens, and blankets—are being requested for the children of Afghanistan, and we are being asked to send items especially for children who are ages 5 through 12. This includes child-sized blankets, as well as baby blankets. The Lamia Afghan Foundation has a primary distribution of aid in October/November, so that the children will have warm clothing before the harsh winter. However, if the opportunity to send a shipment comes up earlier in the year, we will certainly take advantage of sending what we can at that time. The Lamia Afghan Foundation has access to secure storage facilities in Kabul where items can be sorted and held for winter distribution. From 2012 through 2014, Wool-Aid sent more than 4000 items to children in Afghanistan through the Lamia Afghan Foundation. It was only because the Denton program temporarily suspended approval for airlifting their relief aid to Kabul that we were unable to send our Wool-Aid items to Afghanistan in 2015. We are thrilled that this opportunity to help has opened up for 2016!